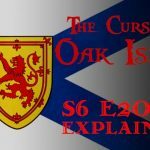 This week’s episode of The Curse of Oak Island is out. Let’s have a look. At the Money Pit area, brothers Rick and Marty Lagina examine fragments of wood that have just been brought up from the 100-102-foot depth of their newest shaft, Borehole T1. Of particular interest is a small oak log, a sample of which has been sent away for carbon testing. 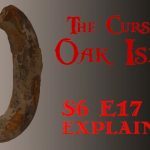 Rick suggests that the log might be a component of the oak platforms allegedly found in the original Money Pit at 10-foot intervals more than 200 years ago. The Lagina brothers consult contractor Andrew Folkins of Irving Equipment Ltd., who tells them that Borehole T1 is currently 112 feet deep, and that he and his team plan to excavate to the 160-foot level. The contractors continue their work, hauling up another load of debris from T1 which contains yet another small oak log. 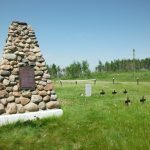 While the men of Irving Equipment Ltd. continue their work, Marty Lagina reveals that the crew brought up a peculiar piece of worked wood from Borehole T1. This piece of wood, which Marty speculates is a hardwood on account of its density, is fashioned into a wedge, and is unlike any other piece of wood the team has extracted from the Money Pit area. After Irving Equipment Ltd. shuts down operations for the day due to uncomfortably proximate lightning, Rick and Marty pay a visit to Dan Blankenship. At Blankenship’s Oak Island residence, the Lagina brothers present the veteran treasure hunter with the various pieces of wood brought up from Borehole T1. Blankenship sniffs several of the dark oak logs, finds them to be foul-smelling, and concludes that they are, indeed, considerably old. Later, Rick Lagina, Charles Barkhouse, and Jack Begley invite stone masons Mike Welling and Mark Fougere to inspect the large, head-shaped boulder unearthed from the centre of Nolan’s Cross (a cross-like arrangement of five conical boulders on Oak Island) by the late Oak Island treasure hunter Fred Nolan. The top of the stone bears a cutlass-shaped indentation which Barkhouse claims was much more defined when he first laid eyes on it twenty years ago. Welling and Fougere declare that the stone is sandstone, and that it is “difficult to say” whether or not it was shaped by man. 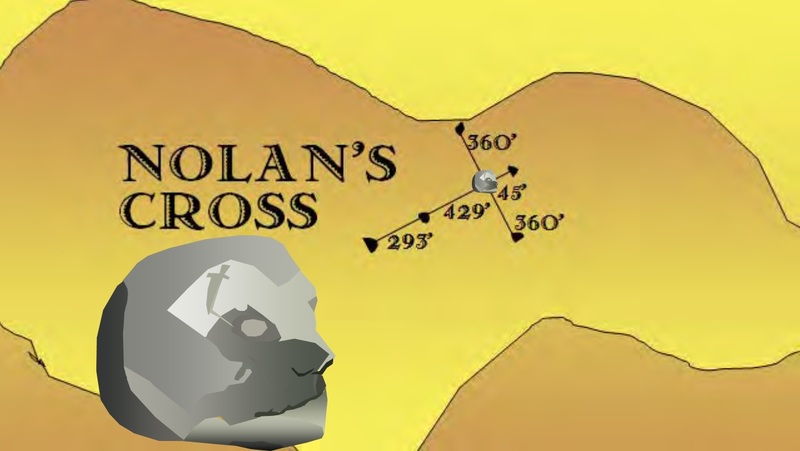 After they have finished with the ‘head stone’, the treasure hunters take Welling and Fougere to the large granite boulder at the bottom of Nolan’s cross. The stone masons immediately marvel at the smoothness of a particular section the boulder’s surface, near its base. Mike Welling remarks “I don’t think it’s natural at all.” The stone masons suggest that it is possible that the boulder’s smoothness is a result of its being dragged. Later that day, members of Oak Island Tours Inc. meet in the War Room. 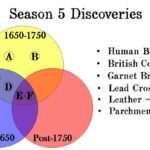 There, Craig Tester briefs them on the results of the carbon dating of the wood brought up from Borehole T1. The first piece of wood, a fragment of timber brought up from the 102-foot level, was dated from 1670-1780 with a 95% degree of accuracy. The second fragment of wood was dated from 1655-1695. 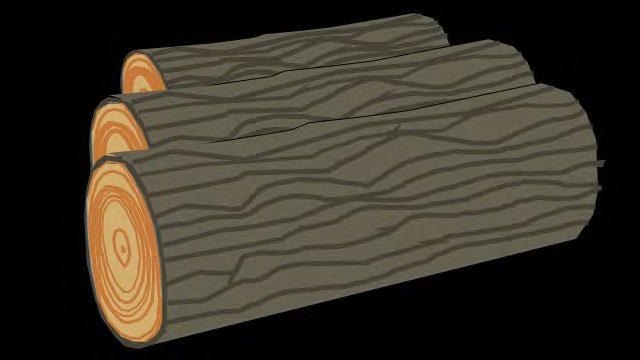 The third and final piece of wood, a length of blackened oak log, was also carbon dated from 1655-1695. 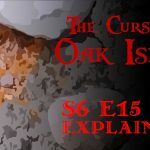 The team members share their suspicions that the oak log might be a piece of one of the original Money Pit platforms, and discuss the implications of this possibility. Later, at the Money Pit area, Rick and Marty Lagina learn that Borehole T1 has nearly reached bedrock. Unfortunately, aside from fragments of old wood, nothing more of interest has been brought up from the shaft. After watching the hammergrab bring up several loads of rock, clay, mud, and water, the Lagina brothers concede that things are looking bleak for Borehole T1. Suddenly, the Oak Island team is approached by Andrew Folkins, who explains that the men of Irving Equipment Ltd. are unable to advance the T1 caisson beyond the 156-foot level. Marty suggests that perhaps the caisson has encountered metal. 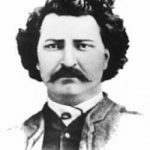 The narrator then describes how previous treasure hunters, including William Chappell and Frederick Blair of the Oak Island Treasure Company, had encountered what appeared to be impenetrable iron barriers at depth. Unfortunately, a subsequent hammergrab investigation reveals Oak Island Tours Inc.’s impenetrable object to be bedrock. With great reluctance, the team decides to put an end to excavations in Borehole T1. Later, at the War Room, Rick and Marty Lagina phone up Craig Tester in order to discuss their predicament. 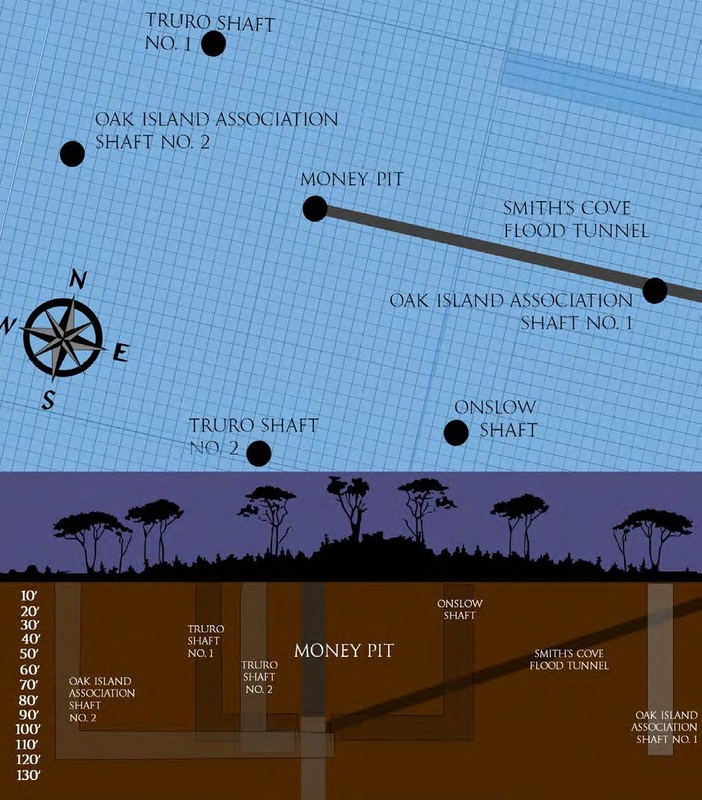 Marty begins by saying, “Well, by this time you are aware that we have now dug three very deep, very expensive, very large holes in the Money Pit, but no vault, no treasure.” He says that Oak Island has dealt them three strikes, and that if their Oak Island treasure hunt were a baseball game, they would be ‘out’. 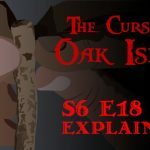 Rick counters by saying that the analogy would be relevant if they were in the ‘bottom of the ninth’; according to Rick, Oak Island Tours Inc. is, in fact, in the bottom of the eight inning, figuratively speaking. For some time, the brothers passionately discuss whether or not they ought to wrap up their affairs in the Money Pit area. Ultimately, Rick, Marty and Craig agree to sink one last shaft at the location at which Rick believes the Money Pit treasure to be. The Lagina brothers preemptively christen this new shaft “the George and Anne Lagina #1”, or GAL1, in honour of their parents. Rick explains that, according to accepted Oak Island history, the original Money Pit shaft collapsed two times in the last 200 years. These collapses, he believes, likely scattered the Money Pit treasure throughout a relatively wide area, and he would like to sink Oak Island Tours Inc.’s fourth shaft in the location at which it will most likely intercept treasure fragments. The narrator then describes how the Oak Island Association, in 1861, dug a shaft beside the Money Pit and tunneled laterally towards it in order to avoid the Smith’s Cove flood tunnel. Unfortunately, this tunnel undermined the structural integrity of the entire Money Pit area; before the tunnel reached its destination, the Money Pit itself collapsed, immediately flooding the tunnel with mud and clay. 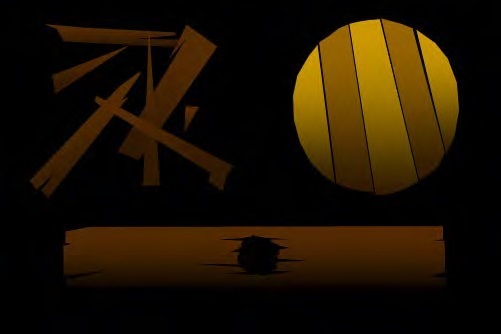 Ever since this first collapse of the Money Pit, many Oak Island theorists have speculated that the Oak Island treasure is dispersed throughout the Money Pit area. Later, the Lagina brothers relay their decision to sink a fourth shaft to Andrew Folkins. The men mark the location of the future borehole with spray paint and prepare to sink their final hole. 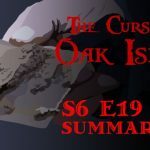 In this episode, the men of Oak Island Tours Inc. brought up a number of old oak logs from Borehole T1. When the logs were carbon dated from 1655-1695, crew members speculated that they might be relics of the 10-foot oak log platforms allegedly discovered in the original Money Pit. 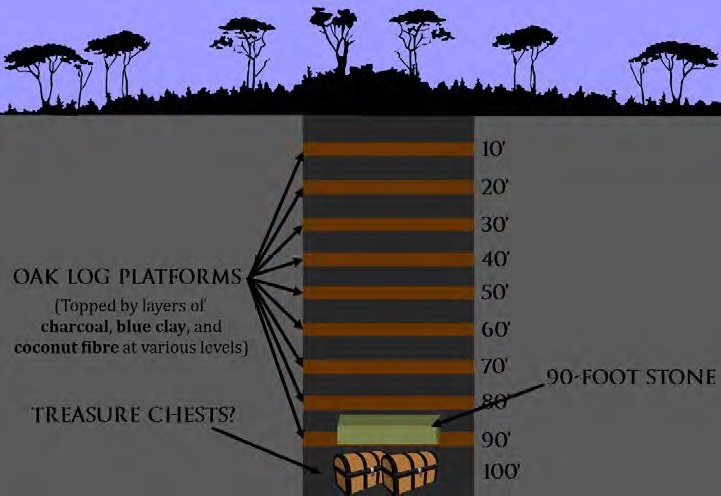 According to many versions of the 1795 Oak Island discovery legend, Daniel McGinnis, John Smith, and Anthony Vaughan unearthed three platforms comprised of tightly-fitted oak logs embedded into the clay walls of the Money Pit at 10, 20, and 30 feet below the surface. 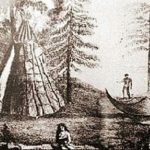 Most sources claim that the oak logs were six to eight inches in diameter, and were rotten on the outside, indicating that they had been there for some time before the discovery. 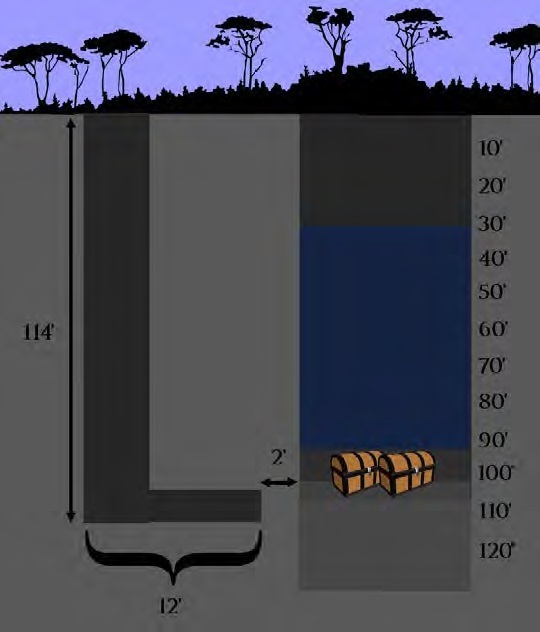 Building uponMcGinnis’, Smith’s, and Vaughan’s discovery, the Onslow Company’s (Oak Island’s first real treasure hunting syndicate) excavations revealed that platforms of oak logs embedded in the clay walls that surrounded them punctuated the circular shaft of the Money Pit to a depth of 90 feet. According to some accounts, covering some of the oak platforms were layers of charcoal, beach stones, blue clay, and coconut fibres. In 1981, Oak Island treasure hunter Fred Nolan, a professional surveyor, discovered five large cone-shaped granite boulders on his property which, when viewed from the air, form a massive cross- Nolan’s Cross. Nolan also discovered a sixth stone buried underground at the centre of this cross. 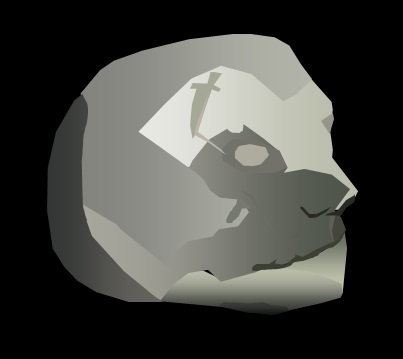 This sixth stone, composed of softer sandstone, vaguely resembles a human head, and bears a cutlass-shaped indentation on its crown. To date, no one is really sure whether the stone’s peculiar features are the result of natural erosion or the hand of man. The measurements between Nolan’s head stone and the four granite boulders that surround it are all exactly the same: precisely 360 feet. 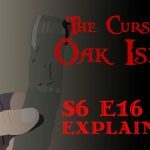 In this episode, Rick Lagina states his belief that the Money Pit treasure is scattered at depth as a result of two major Money Pit collapses. The Money Pit first collapsed in 1850. The men of the Truro Company, Oak Island’s second major treasure-hunting syndicate, had just discovered the box drains at Smith’s Cove, and were determined to circumvent the Smith’s Cove flood tunnel (which’s existence the box drains implied). They dug a shaft 18 feet south of the Money Pit to a depth of 112 feet before tunneling laterally towards the Money Pit. Unfortunately, this shaft flooded with seawater once it came within a short distance of its destination. 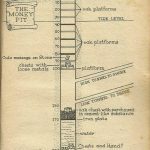 The flooding was accompanied by a tremendous crash and the crumpling of the cribbing in the Money Pit, leading the company men to speculate that the bottom of the Money Pit had likely dropped out into one of the three tunnels below it. This unfortunate development spelled the end of the Truro Company. 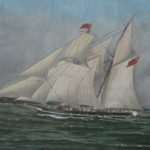 More than a decade later, in 1861, members of the Oak Island Association encountered a similar situation. 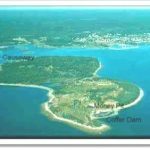 Cognizant of the presence of the Smith’s Cove flood tunnel, the Oak Island Association members sank a 118-foot shaft 18 feet west of the Money Pit (the Smith’s Cove flood tunnel almost certainly approached the Money Pit from the east) before tunneling laterally towards it. Much to the pleasure of the Association men, the tunnel reached the Pit without being flooded out; the circumvention was a success. 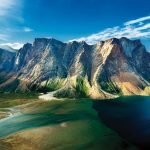 With the elusive treasure nowhere to be seen at that 118-foot depth, the labourers dug through the Money Pit to the eastern side. This decision would cost them dearly; as soon as they had breached the eastern wall of the Money Pit, water began to seep in from the east. In no time, the shaft was completely flooded with seawater. To make matters worse, crew men noticed that water was also starting to seep into the Money Pit which had, until then, remained relatively dry. George Mitchell, the superintendent of the Oak Island Association, rose to meet this new challenge by initiating a huge bailing operation involving sixty men, thirty horses, and several 70- gallon bailing casks. The men, animals, and machines worked around the clock for three days straight. By the third day, the flooding problem was under control. 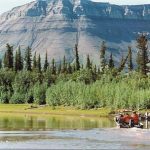 At this point, the Association men hoped to clear the tunnel they had previously dug- which, as a result of the flooding, had become choked with mud and clay- and resume their excavation of the Money Pit where they had left off. 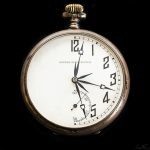 No sooner had labourers entered the tunnel to clear the mud, however, than, according to Jotham McCully, “they heard a tremendous crash in the Money Pit and barely escaped being caught by the rush of mud which followed them into the West pit and filled it up 7 feet in less than three minutes. In the meantime a stick of oak timber of considerable girth and 3 ½ feet in length was ejected with the mud.” Apparently, as had been the case with the Truro Shaft in 1850, the tunnel underneath the Money Pit had weakened the structural integrity of the layer of earth above. The Money Pit had collapsed, and along with it all the cribbing the Oak Island Association had constructed. 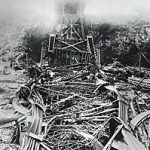 The only comforts the Association members could find in this catastrophe were in the discoveries made by labourers who had been clearing the tunnel of debris at the time of the Money Pit’s collapse. One of the labourers recovered man worked wood which was “stained black with age.” Another recovered an object which has been described as yellow-painted wooden dish or bottom of a keg. Another still had recovered what treasure hunter James McNutt described as “a piece of juniper with bark on [and] cut at each end with an edge tool,” as well as “a spruce slab with a mining auger hole in it.” These encouraging finds verified what the Oak Island Association already believed: that sometime in the distant past, men with more primitive technology had made a colossal effort to dig deep beneath Oak Island, presumably to bury a treasure of incalculable value. Many of the large stones on Oak Island have symbols incised into the surfaces. The “Head” Stone that was/is located at the centre of the Nolan’s Cross formation is no exception. The incised symbols on that stone actually form a map. It includes all of the map features and details that are included on a map called the “Key or Kidd Map”. 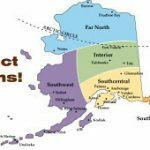 The map(s) include details about where tunnels and tunnel entrances are ( or at least “were”) located and the locations of treasure sites. The information is all there in plain view on these (and other Oak Island treasure maps). It is merely a matter of knowing how to read them.